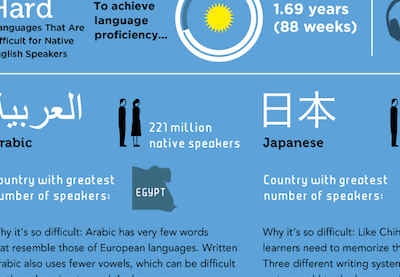 Before handing out the infographic, discuss the following questions with your students: Are some languages harder to learn than others? In your opinion, which ones are the most difficult to pick up? As the graphic describes, successful language learning depends on a variety of factors. Which of these have you found to be the most important for your own language learning? Can you think of any others to add to the list? Do you agree with the FSI’s language difficulty scale? If not, what would you change? The Foreign Service Institute’s language difficulty rankings reflect learning expectations for native English speakers only. 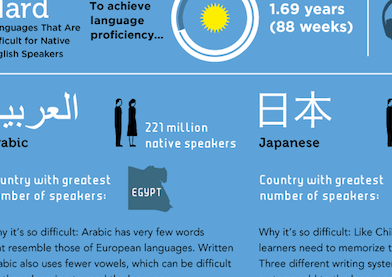 How do you think these rankings would change for language learners with different L1s? High school and university students who are required to study a foreign language often choose the language that seems “easiest”. What arguments could you present to such students to encourage them to study a “harder” language like Arabic or Chinese? After reviewing this infographic with your students, have them write a an essay or blog post on the topic below. In addition to using the information from the infographic, students can do independent research using the sources provided at the bottom of the graphic. Describe your own language learning experiences. What languages have you studied, and how easy or difficult have they been to master? In your opinion, what makes them so easy or hard? Support your answer with specific examples of vocabulary, grammar, pronunciations, etc. that have either given you trouble or been a breeze to learn. This entry was posted in Archive and tagged foreign language, learning.